Etiology: Sore hocks occur because of pressure necrosis of the skin from bearing a heavy body weight on a hard or wire surface. There is genetic predisposition in breeds such as the Rex which have poorly furred footpads and rounded metacarpal bones. Incidence: The incidence of ulcerative pododermatitis is uncommon in research rabbits. Clinical Signs: Common findings are circumscribed ulcers over the metatarsus and metacarpus, covered by a scab. 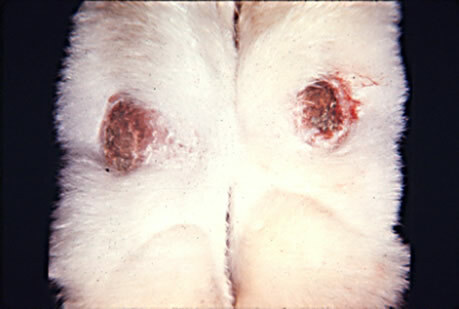 Staphylococcus aureus may secondarily infect the wound. Severely affected rabbits may be anorexic, debilitated, and die. Diagnosis: The diagnosis is based on history and clinical signs.